As big fans of well-made indie platform games, we’ve been looking forward to getting our hands on Cuphead. The moment we started playing it, we were reminded of some of our favourite indie platformers such as Super Meat Boy and VVVVVV, although it’s really a run and gun shoot ’em up. We’re big fans of excellent level design and punishing difficulty levels, as long as the experience is rewarding – both of which the game promised since we first previewed it at Gamescom 2015. Both Super Meat Boy and VVVVVV demand perfection, where death results if you lands just one pixel in the wrong direction, and the only way to win is by honing your reflexes to get better with each try. Cuphead is exactly that kind of game. Outside of this, Cuphead’s defining feature is its deliberately retro feel. The game’s graphics mimic 1930s cartoons, replete with grainy animations, and the result looks gorgeous. The art style is definitely one of the standout elements of this game — it almost made us want to find a black-and-white CRT TV and plug our Xbox One into it to play Cuphead. This game has a pretty simple story that does a barbones job of making you care about clearing various levels. Cuphead and his brother Mugman are living with their guardian Elder Kettle. The two kids are always out adventuring into the woods, and one day they head to the Devil’s Casino run by a scheming chap called King Dice. The brothers win a lot of money, and King Dice then summons the Devil. 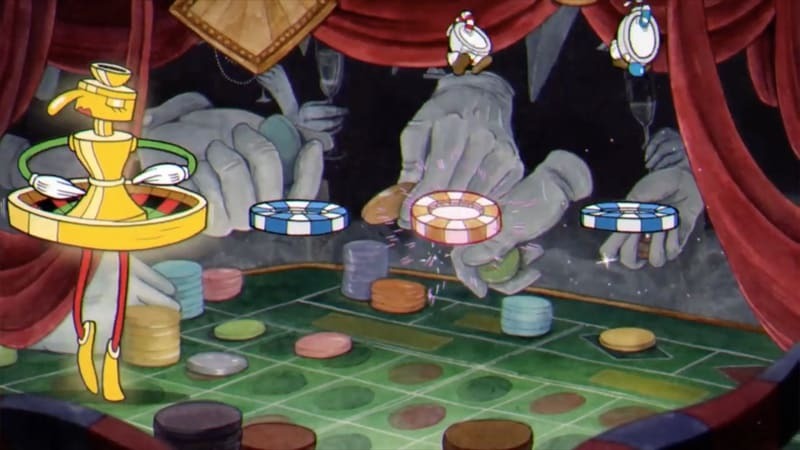 In spite of his brother’s warnings, Cuphead takes a bet with the Devil, and loses. The Devil wants their souls, but offers them one chance to save themselves, by collecting contracts of others who’ve lost their souls. This is where you step into the shoes of Cuphead and start playing the game. There’s also a two-player local co-op mode where the second player plays as Mugman. However, the co-op mode raises the difficulty level so you want to play with someone who’s good at platformers. Cuphead is almost exclusively about boss fights, and when you aren’t fighting bosses you are exploring the world in a top-down view. You’ll meet some characters and talk to them, and go about looking for secret areas, bonus missions, and boss fights. Each boss fight is easy to find but very, very difficult to win. There are two difficulty levels — simple and regular — but if you think you can quickly finish the game in simple mode, you’re mistaken. You only get the contracts of each boss in regular difficulty, so to finish the game you’ll definitely need to up your level. 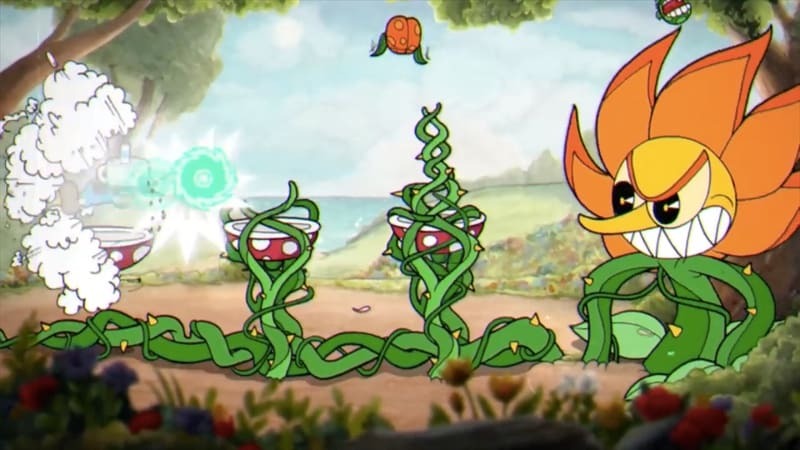 The punishing difficulty is our favourite aspect of Cuphead. While it is very frustrating to die over and over again, we found ourselves going just that little bit further in the level than before, until we finally cleared the stage. Each boss has completely different attacks and platforming challenges lined up for you, so Cuphead doesn’t ever feel repetitive. We treated our first few playthroughs as an exercise in learning the boss’s attacks and then started trying to defeat it in earnest. Cuphead can shoot bullets via his fingers and he has special attacks too. He can dash, jump, move forward or back, shoot bullets and use the big special attack, and perform a move called parry. This move involves hitting the jump key when Cuphead is in the air and near any pink coloured enemy or object. Parry helps you kill ghosts or activate certain machines in the game. The default controls map dash, jump, shoot, and special attack to the four buttons (A, B, X, Y), but these are far from ideal. We found it much easier to play the game with shoot mapped to LT and special attacked on RT. Boss fights aside, Cuphead has a bunch of bonus levels in case you’re interested in rewards such as new weapons or coins. These levels are just as challenging and some of them are like traditional 2D sidescrolling platformers. The boss fights usually take place on one screen and don’t involve many “run-and-gun” elements, which some bonus levels offer. This adds a bit more variety to the game and gets a big thumbs-up from us. If you were expecting a platformer like Cuphead’s marketing material suggested, think again. It has more in common with the likes of Contra than Mario. Cuphead is an 11GB download on the Xbox One, which is on the higher side for this kind of game. Our only complaint with it are the long loading times. Every time you enter a boss fight, the game makes you wait for 30 seconds to a minute, before the fight begins. Considering the fact that the game has modest system requirements on a PC, we find this loading time unacceptable. We’d also have loved it if each level restarted the moment Cuphead died to avoid delays, and also hitting the Retry option over and over. Super Meat Boy does this very well and we feel it’s a delay that can be avoided in a challenging game such as this. If you enjoy challenging games, you will love Cuphead. It has all the elements of a great shoot ‘em up— fun music, great level design, nice collection of weapons, and a rewarding difficulty curve. Long loading times aside, Cuphead gets pretty much everything right. Gadgets 360 played a digitally downloaded review copy of Cuphead on an Xbox One. It’s available as a Play Anywhere title on Windows 10 and Xbox One at Rs. 1,324. It’s also available for the PC via Steam at Rs. 565.